I know that many girls are big fans of tulle tutu. As we all want to push our boundaries and make statements with what we wear, the tutu is a girly way to make your statement. However, it seems to be quite tricky to mix and match your tulle tutu, since we all know that there is a real fine line between looking weird and looking amazing. Obviously, things will be messed up if you haven’t mix match the tulle tutu, fluffy skirt, which is dreamy and wonderful, in the right way. So, let me show you how to show your personal chic by wearing tutu in this autumn. As pairing the tulle tutu, contrasting textures look incredibly amazing. You have special love for tulle tutu and want to keep your outfit from looking too girly, I am sure that the womens jackets in black do help a lot. Personally, I prefer styling tutu with tougher tops to add a saucy vibe. Similar with the black jacket, denim shirts or denim jackets are also saucy to pair with. As an intriguing combination, this kind of outfit is adored by many girls. 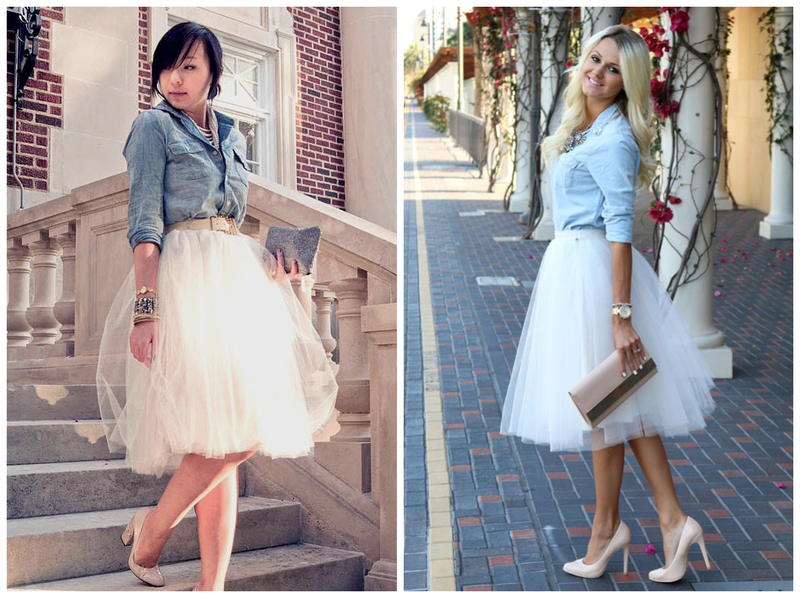 Compared with the black jacket, matching the tulle tutu with the women blue denim shirts seems to be saucier and cuter. Have this one already got your attention? In general, the tutu is voluminous and gorgeous with the lace or sequins which do make the tutu look attention-grabbing, so it’s more suitable to keep the rest of your outfit toned down. A knitted sweater in solid color will be the better choice, and the sweater does keep your body warm as the weather is turning cooler. Do you own a wonderful tutu? And do you want to wear it in the autumn for a casual look? If so, you should have try on the combos that I show you above.